Want to master the basics of Java programming in a short period? If so, you're in the right place! This book is exactly what you need. If you've wanted to learn how to program using Java you have probably thought it was a difficult and long process. This is actually not the case at all. Java can be an extremely easy and straightforward process. The days of searching countless websites to find what you're looking for are over. With this book you will have everything you could possibly need, all in one place! 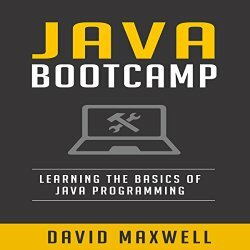 What this book will give you: Java basics for beginners. This book will take the process of programming and break it down into straightforward simple steps that anyone can follow. The different types of data. This book will present all of the important data you need to know and will walk you through how to use it. The common errors. This book will show you the most common errors you will experience and how to fix them and avoid them altogether. What you will learn: The basics of Java Must-know tables How to create programs What are data and variables How to use variables The fundamental concepts Java sequences Selection statements The different types of data The most common errors and how to handle them And much more! All of this information will be presented to you in easy to understand, straightforward steps. For anyone starting out, this is your best option to learn Java in a short period of time. Try it out for yourself. You won't be disappointed. Now it's time for you to start your journey into Java programming! Click on the Buy Now button above and get started today! I look forward to hearing about your success!